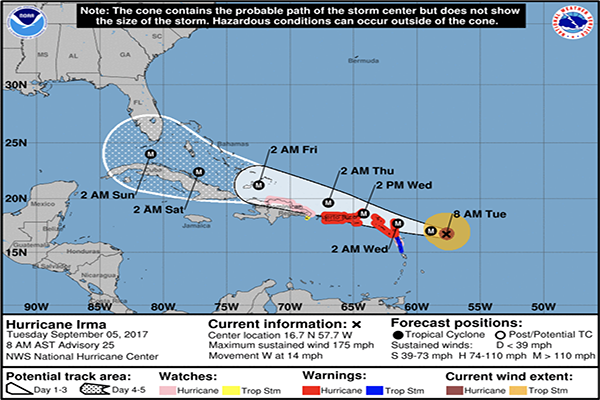 September 5, 2017 – Hurricane Irma continues its trek across the Atlantic and current models have it projected to impact Florida as early as Saturday. Irma, the ninth-named storm of the 2017 hurricane season quickly gained strength and is currently a Category 5 storm packing winds of 180 mph and is moving west at 13 mph. As of the Tuesday, Sept. 5, 2017, 11 a.m. tracking numbers, Irma is located at 16.8 N 58.4 W and is already being felt in the Leeward Islands. On its current projected track, Florida could be feeling the effects of Irma early Sunday morning. Should the storm continue on the current projected track, the Santa Fe College community will be impacted later Sunday and throughout the day Monday. Students, faculty and staff need to prepare for potential heavy rains and gusty winds, however these are still very early projections. Most forecasters say that anything beyond a three-day prediction becomes less accurate. The SF Emergency Management team is monitoring Hurricane Irma and will provide updates as they are available. All students, faculty and staff are encouraged to download the Safe Santa Fe app on their phones. The app will send important safety alerts concerning Hurricane Irma and any other public safety information. SF employees are also encouraged to go to eStaff on the Santa Fe College website, click on the “My Information” link and update your contact information under the “Emergency Notification Info” tab.